און גיסן זיך אױס אין צװײ פֿאַרבן: גאָלד און זילבער. פֿאָרט אין קאַרעטעס, קערט װעלטן! האָב איך מורא, טאָמער מײנט ער, אַז איך מײן עפּעס. 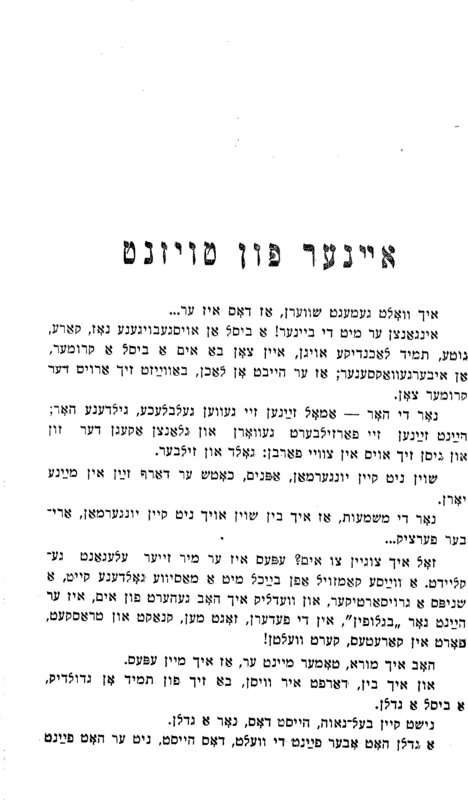 נישט קײן בעל־גאװה, הײסט דאָס, נאָר אַ גדלן. un gisn zikh oys in tsvey farbn: gold un zilber. fort in karetes, kert veltn! hob ikh moyre, tomer meynt er, az ikh meyn epes. nisht keyn bal-gayve, heyst dos, nor a gadlen. און‪and גיסן‪pour; mint (money) זיך‪self אױס‪out; because of אין‪in צװײ‪2 פֿאַרבן‪color; paint: גאָלד‪gold (Au) און‪and זילבער‪silver (Ag). פֿאָרט‪travel (by vehicle); after all אין‪in קאַרעטעס‪carriage (vehicle), קערט‪turn, clean; could, might (+ infinitive, usually impersonal + dative) װעלטן‪world! האָב‪have; give birth איך‪I מורא‪fear, טאָמער‪perhaps; lest; if perchance מײנט‪intend ער, אַז‪that; when; if איך‪I מײן‪mostly; intend; intention עפּעס‪something; somehow; somewhat; very. אַ ביסל‪bit אַ גדלן‪great one; arrogant person. נישט‪not קײן‪to; not any בעל־גאװה‪proud person, הײסט‪order, tell; be called, be named דאָס‪the, this; buttocks; defecate (slang, impolite), נאָר‪but, only אַ גדלן‪great one; arrogant person.